Meet Miriam! 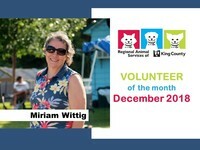 Miriam Wittig is one of RASKC’s hardest working volunteers. She’s super nice too. Having been raised on a farm, Miriam has been around dogs, cats, and other small and large animals for much of her life. A longtime resident of SeaTac, Miriam has been volunteering twice a week since 2014. She serves as a Shelter Helper and as a Shift Lead on the Early Morning Cat Crew. Miriam has trained many new volunteers. She has contributed over 600 hours so far. (Thank you, Miriam!). An interview with Miriam can be found on our website and blog. Thanks to Pawsitive Alliance and Q13FOX for featuring RASKC animals in the #Home4thePawlidays virtual adoption event. Pawsitive Alliance's website and Facebook page feature our cats Anastasia, Checkers, Maya, Midnight, Slinky, Stevia, Voodoo, plus dogs Flower, Frank, and Pearl! The Pawsitive Alliance Facebook page also includes a 19-minute video of RASKC volunteer Tiffany Morin and several cats at our pet adoption center. Today Q13FOX posted on its website a special feature on RASKC cat Slinky. Many of RASKC's featured animals have already been adopted. In fact, cat Voodoo was adopted today! She has been residing at RASKC since mid-June. The "Home4thePawlidays" event is taking place from December 1- 18 to help 100 pets from nine organizations. RASKC is offering a 50% discount on many of our adoptable animals throughout this month. For the sixth consecutive year over 60 RASKC volunteers are wrapping gifts at two Barnes and Noble stores this month to raise money to benefit RASKC’s Angel Fund. The Angel Fund covers the extraordinary medical expenses for some of our most vulnerable animals. If you would like to make a contribution to the Angel Fund, especially as a holiday tribute to any person or animal, go here. Volunteers are wrapping gifts this weekend and next weekend at Barnes and Noble in Tukwila (near SouthCenter) and in Federal Way. Come visit the volunteers. If you have a small dog, Barnes and Noble encourages you to bring it along too. Special kudos to volunteer Jini Allen who coordinated this project for the past two years and who is providing invaluable support again this year. Welcome to Tatianna Miller, who has started a temporary position at RASKC as an Animal Care Technician. She brings a wealth of experience from working at animal shelters in Wenatchee and Auburn. At these shelters she has worked as an Intake Coordinator, Behavior and Transfer Coordinator, Foster Care Coordinator, and Vet Assistant. 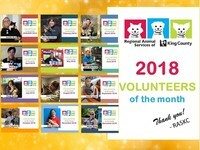 A round of a paws for 2018 Volunteers of the Month! 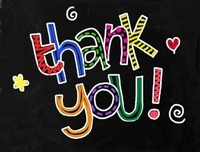 RASKC thanks all volunteers who contribute the most precious resource of all- one’s time. We pay special tribute to the exceptional volunteers who have been honored as Volunteer of the Month this year. Thanks to Kirkland Petco and Covington Petco for designating RASKC as the beneficiary for their Santa photo events this month. Thanks to two Mud Bay stores for their holiday "Giving Trees." RASKC volunteer Shannon Weiler is working with Mud Bay stores in Kent and in Fairwood to promote donations throughout December to help RASKC animals. Kermit is a 3 year-old male Pit Bull mix (ID #A574228). This handsome boy is very sweet and snuggly. He also loves to play and have fun! Kermit can be a bit shy when meeting new people or being in new environments. When he warms up, however, Kermit is a big ol' sweetie who loves to do zoomies all over the yard! Kermit loves to play with people, and already knows how to "sit" and "shake." He does well with other large dogs, but would benefit from a slow introduction. 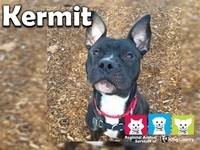 Kermit has a RED personality, meaning he is a spirited dog with a fun-loving personality. He is still working on his manners and would do best with a family who is willing to work with him and help him become the best dog he can be. Kermit is neutered, current on vaccinations and microchipped! His $100 adoption fee also includes a free visit to the veterinarian of your choice, and 30 days of opt-in pet insurance through Trupanion. RASKC features Pets of the Week on our website. Several suburban newspapers also highlight RASKC’s Pet of the Week, thanks usually to the work of volunteer Dawn Gerken. RASKC’s previous Pets of the Week can be viewed on our blog. 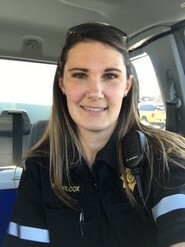 Animal Control Officer Allison Wilcox has been working for RASKC/ KCACC for more than 12 years. (RASKC was previously known as King County Animal Care and Control). What is your role at RASKC? I’ve been an Animal Control Officer at RASKC for over twelve years. I started my career working in the shelter before transitioning to the field four years ago. On an intermittent basis I serve as an acting sergeant in both the field and shelter. What did you do prior to coming to RASKC? Prior to working at RASKC I worked in my parents' boarding kennel. The hours were long, and I did everything from animal care to supervising other employees. What are the best parts of your job? I enjoy working with and helping animals as well as people. The opportunity to educate pet owners is something I look forward to each day. What do you do when you’re not at work? When away from work, I enjoy being outside whether fishing or hiking. I also pass my free time baking, doing crafts, and spending time with my five year old son, Hudson. Please describe a memorable moment with an animal. I often look at the lost dog reports posted on our website and recall seeing a stray dog listed from SeaTac. I contacted the owner who had lost his dog over 90 blocks away! The dog was skittish, so it took quite awhile to get the dog- even after the owner showed up. I also once got a cat’s head unstuck from the window of a dollhouse. There are so many good and funny stories from my time in the shelter and field, it is difficult to pick just a couple of them. 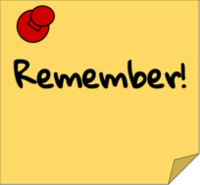 If you’d like to receive an email reminder or a text reminder of your scheduled shifts, you may sign up in the “My Profile” section of your online record. Please upload your photo in the “My Profile” section of your online record if you have not done so already. If the roads are snowy or icy, you are never expected to come to your scheduled shift. Your safety is most important. In these situations please follow the regular absence protocols. If you would like to attend new volunteer orientation in Kent on Saturday, January 12, there are two seats open. For more information go here. Another session is being offered in Kent on Tuesday afternoon, January 15. For more information, go here. RASKC will be offering new volunteer orientation in downtown Kirkland on Saturday, January 26. For more information go here. Note: If you have not yet attended new volunteer orientation, please contact the Volunteer Program for possible “fast track” consideration. Priority is given, however, to people who have already attended the session and who have already submitted the required paperwork. Thanks. Cat Meet and Greet @ RASKC/ Kent. 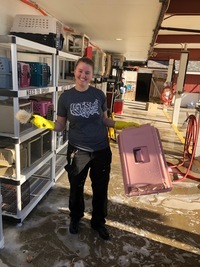 Contact Sarah S.
Covington Petco Cat-Care Team Contact Sarah L.
Reber Ranch Cat-Care Team Contact Sarah L.
Tukwila Petco Cat-Care Team Contact Co-Lead Carrie D.
Thanks for all that you do to help animals! For general questions: adoptapet@kingcounty.gov or 206-296-7387 (PETS). For questions, comments, or suggested topics or photos for future eNewsletter editions, please contact Volunteer Program Manager Sarah Luthens. Missed the last enewsletter? Check out our archives page!